A few weeks ago my colleague and close friend, Julio From NY, tweeted and used a peculiar hash tag (something to the effect of #oneaweek2011). At first, I thought it was some sort of diet program or strange New Year’s resolution. It turns out it was referring to a challenge at The Daily Post on WordPress.com. While I could very well do “one post a day” I think the challenge takes the focus away from quality and leans more towards quantity. No bueno. One A Week makes sense. As an SEO and SMO-minded web designer, copywriter, and editor on various fronts, the perfectionist in me dictates that I do not post anything that is at least somewhat interesting and has something for curious web searches to stumble upon. Here I am trying to stick to this challenge. I already mentioned I am involved on various fronts so this will be tough for me. While I know I preach that you have to stay persistent as a blogger or you will lose your audience, it’s tough to do so when you also do freelance writing and try to sell, syndicate, or share other content via different distribution channels. One post a week means you have more people returning more often. When people see your commitment, they will be more likely to share your content with others! I have several things in the pipeline for my blog here on WordPress. I hope to syndicate some content and get some quality backlinks going too. Some of the topics I wish to discuss include latest video game releases (Marvel Vs. Capcom 3 and Dead Space 2, for example), the state of the video game industry, the economy of gaming, current projects I am working on, and, of course, random rants and raves thereof. I invite you all to brainstorm your ideas now and stay persistent. Don’t lose momentum! If you’re doing the One A Week 2011, post on my comments and/or guestbook – I’ll be sure to add you to my blogroll and promote your featured articles whatever way I can! If you run out of ideas, maybe we can brainstorm together too. I’m never without ideas.. Just need to carve out more time. Good thing I have this handy-dandy WordPress app for my Blackberry Bold – now I can blog on-the-go! I’m really passionate about writing. Specifically, blogging is a great way to learn more about topics you are truly interested in, while writing in a manner that is fun and fresh. In fact, I find out so many interesting things in my SEO research, Wiki lookups, and random reading that I find myself overwhelmed by the many topics to write about. My hopes are to focus more and more on writing and game design, my biggest passions in life. Part of that will be moving my WordPress blog to a self-hosted setup. I’m excited! Let’s do this OneAWeek2011 FTW! Think you have what it takes to stay persistent with your blogging efforts? Leave a comment on this article and get a badge for yourself! Currently, we are only offering the free rollover minutes to loyal AT&T customers. If you did not receive a text message with the offer, requests will be processed on a case by case basis. He then went on to add that, if I got the confirmation stating that I would receive my free 1000 rollover minutes in 4-6 weeks, then I qualified. There seems to be a few discrepancies here, especially since he said it may take 6-8 weeks. I imagine the demand is rising rapidly, especially since this offer only popped up on the interwebz around Saturday, February 12th 2011. 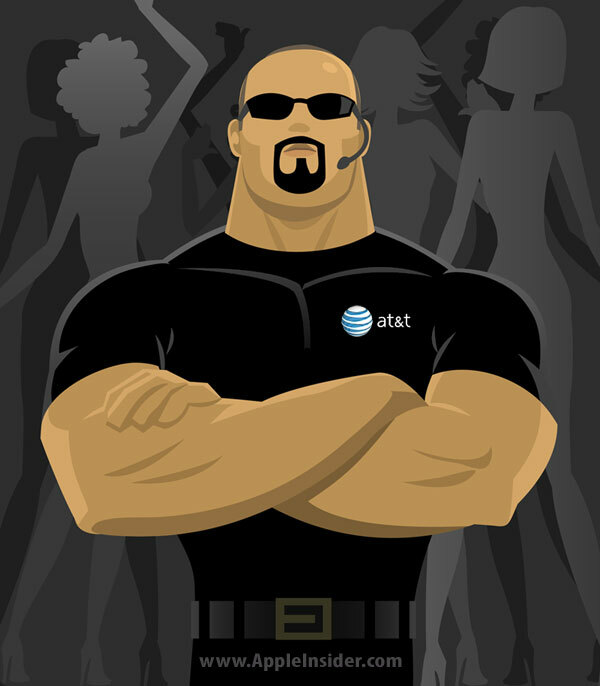 Hey, every business needs a gatekeeper.. Why NOT a big, bald guy? I suppose that is the sort of beat-around-the-bush response you can expect from any CSR (Customer Service Rep in vanilla speak). You can see the value in having AT&T limit how many people go on to tell their friends. Quite frankly, I was surprised there was no mention of the free rollover minutes loyalty offer on their web site, prerecorded messages, or even the official AT&T Facebook page. That said, I have a feeling that they’re going to approve everyone automatically but they’re going to position the offer as a perk for “loyal customers”. At this point, they’re probably trying to control call volume while not creating any more buzz about this whole thing than there needs to be. Well, I couldn’t fight the urge anymore. With as much work as I have on the table, I owe it to you, my loyal readers, to bring back the passion and frequency of my blog and what better way than to take potshots at one of the biggest and crappiest pseudo-monopolies out there? That’s right, it’s time to attack Microsoft once again! XBox LIVE customer support analysts actually laugh and hang up on customers. The ultimate solution for most problems plaguing XBox 360 seems to come down to buying a new system, creating a new account, or hearing “we can’t help you”. XBox 360 units are still experiencing random crashes (surprise), red rings, and other hardware failure. The magical XBox 360 warranty (which comes at an additional cost) does not include much at all; in fact, shipping and even boxes come at additional premiums in many cases! Prepaid XBox LIVE subscription cards are more trouble than they’re worth – some don’t even code with a code behind the silver coating, due to misprints (good luck getting anyone to give you credit or a full refund for that)! The most over-used line of any XBox LIVE customer support representative is “sorry, but that’s our policy”. No one on the XBox LIVE support team seem to speak English natively, nor do they understand the root cause of your issues and what the customer TRULY needs. It is not unlikely for random people to harass you, just for fun, and file false complaints against you which, ultimately, get you terminated. Since the XBox LIVE team doesn’t really understand English, they just go by “what’s in their system” and follow their scripted courses of action. A few strikes and you’re out. Good luck appealing. If you’re like me, you may be looking at this list with great disgust. Anyone that knows me knows that poor customer service, unwarranted rudeness, and poor product “follow-through”/overall quality are things that I absolutely abhore. As a gamer and someone that happens to be an XBox 360 owner, I feel that Microsoft’s business tactics are completely unethical, to say the least. We shouldn’t be surprised since the XBox franchise is a microcosm of Microsoft’s track record in all other facets of their huge corporate monster. I say it all the time: communication is a dying art. Communication is becoming more and more watered-down because human interaction is becoming so limited. As generations progress, we, the human creature, develop a greater need for space. It’s no wonder that people are more bulletproof, ideaproof, and recluse than ever before! We’ve become desensitized to just about everything, mostly because of the fears we’ve been instilled with by the mass media and the fact that, those we were raised around, never really learned the power of warm connections. Along comes the Free Hugs Campaign to chop away at those barriers that many of us have erected. I firmly believe that we could all use a hug in this day and age. Some cultures are strict about physical contact and, in some places, government forbid many types of public displays of affection – it’s really a shame! Naturally, one must know their limits when matters of touch are concerned. Just like any marketing or communication in general, it is important to obtain the permission first. Once that door is open, let the warmth pour in! A few articles back, I talked about Oreo and how their message is simply this: we are America’s favorite cookie. These are the sorts of messages that can backfire but, executed properly, you really boost the perceived value tenfold. The brilliance in Oreo’s current strategy lies in their use of contests and celebrity lick races, promotions that people talk about with others. These are ideas that spread in a viral manner or, as Seth Godin puts it, ideaviruses. The key to this strategy is creating simple, consistent messages that anyone can spread onward; of course, you have to get people excited. In this article, I’d like to discuss a marketing strategy that is a little less buzz and hype-driven yet still viral in nature. Let’s look at a simple thing that everyone uses (well, mostly everyone): a toothbrush. Traditional marketing and old money business people will tell you that the better toothbrush will sell more but what does “better” actually mean? It depends what your target customers are. For kids, both big and small (some of us are still kids at heart), cartoon-stickered and music-generating toothbrushes are the epitome of oral hygiene devices.